TORONTO—Spring has not yet arrived, but the new season is already blooming at the Canadian Opera Company, as the company announced its ambitious 2016/2017 lineup in a concert event on Jan. 13 at the Four Seasons Centre for the Performing Arts. Featuring some of the world’s greatest operas, including a special Canadian tribute to revolutionary leader Louis Riel on Canada’s 150th anniversary, the new season is bound to intrigue. With six major productions, two events featuring upcoming operatic talent, and free concerts and school programs, the COC has in fact set out to offer operatic opportunities for every day of the year. “It’s a huge spectrum, from Baroque to contemporary, highlighting the Canadian opera with ‘Louis Riel,'” says COC music director Joahnnes Debus who is looking forward to working with a talented lineup of local and international artists. 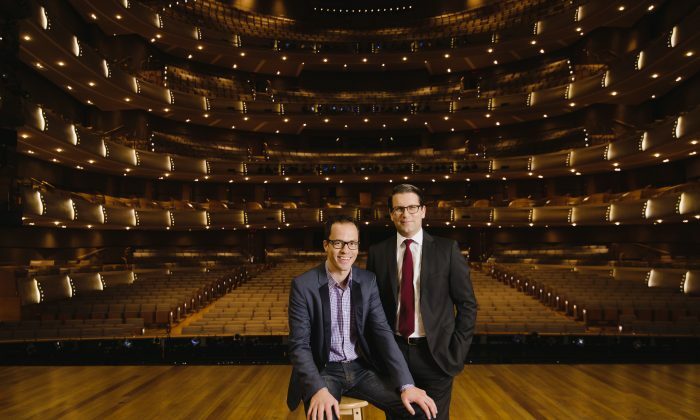 For general director Alexander Neef, the COC’s ability to attract the best talent is related to its commitment to quality and care. “I think we succeed in creating working conditions for artists where they feel that they can make the best art that’s within their possibilities, maybe sometimes even beyond, and they are able to convey that to our audience and really create a shared sense of pride in not only the company, but really the art form,” he says. The new season announcement allows you to put your opera hat on and discover what’s in store in the opera world. Do your research in advance to learn what makes each opera great and if you’re in Toronto at that time, come to learn something new. You’re sure to be in for something extraordinary. ‘Norma’ – The first opera of the fall season is a new COC production of Bellini’s early 19th-century bel canto masterpiece of passion and betrayal. It features Norma, a Druid high priestess who is mercilessly cast aside by her Roman lover. American-Canadian soprano Sondra Radvanovsky and South African Elza van den Heever will share the lead role in the production, which runs Oct. 6 – Nov. 5. ‘Ariodante’ – Handel’s early 18th-century opera of love, honour, and obsession marks the debut of COC music director Johannes Debus directing a Handel opera—an exciting challenge considering this is one of the masterpieces of Baroque opera. British mezzo-soprano Alice Coote will play the trouser role of Ariodante, while Canadian soprano Jane Archibald is the fiancé Ginevra. Also a new COC production, “Ariodante” runs Oct. 16 – Nov. 4. ‘The Magic Flute’ – Who doesn’t love a fairytale journey of love and self-discovery? Add to it Mozart’s spectacular music and the result is one of the most popular operas of all time. Try listening to the “Queen of the Night” aria and you will get a sense of its charm. This is a revival of a previous COC staging by Diane Paulus, which will be undertaken by COC Ensemble Studio graduate Ashlie Corcoran. The talented cast includes veteran and up-and-coming singers, including current COC Ensemble members. “The Magic Flute” runs Jan. 19 – Feb. 24, 2017. ‘Götterdämmerung ‘ – Wagner’s fourth opera returns to the stage to complete the COC’s staging of the Ring Cycle, featuring gods, great heroes, and supernatural figures in epic battles. American soprano Christine Goerke reprises her role of the Valkyrie Brünnhilde, which she first performed with the COC last year in “Die Walkure,” and is set to perform this year in “Siegfried.” This production is a revival of the 2006 production by Canadian director Tim Albery and runs Feb. 2 – 25, 2017. ‘Louis Riel’ – On the occasion of Canada’s 150th anniversary, the COC is staging a new production of Harry Somers’ 1967 tribute to Metis leader Louis Riel who led an uprising in the late 19th century as Canada was expanding westward. To bring to the stage what is considered to be the country’s most famous opera, the COC partnered with the National Arts Centre in Ottawa. Canadian baritone Russell Braun will play the title role in a production that will be sung in English, French, Latin, and Cree. “Louis Riel” runs April 20 – May 13, 2017. ‘Tosca’ – Puccini’s Tosca is one of the world’s most popular operas and with soprano Adrianne Pieczonka and Keri Alkema sharing the lead role, it’s sure to be a passionate endeavour. Featuring some of the composer’s most beautiful music, it is a dramatic work set in early 19th-century Rome. This production is a revival of an earlier COC production by director Paul Curran. For a taste of “Tosca,” listen to “E lucevan le stelle,” one of the most popular arias of all time. The production runs April 30 – May 20, 2017. The COC also offers a glimpse at opera’s future stars with Centre Stage, its vocal annual competition and gala on Nov. 3, 2016, as well as the Ensemble Studio Showcase on Feb. 23, 2017. In the meantime, don’t miss the COC’s current season, which is now in full swing, featuring Wagner’s “Siegfried,” Mozart’s “The Marriage of Figaro,” Bizet’s”Carmen,” and Rossini’s “Maometto II.” They are sure to keep your opera taste buds alive.